Today its a long journey to Pangong lake across the snow covered Changla pass, so I have to hurry. I started waking up the people who were supposed to go with me. 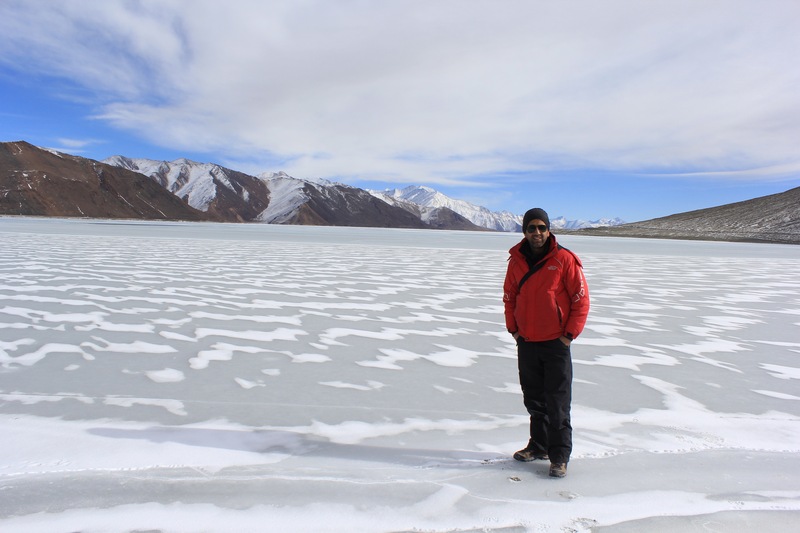 I put on a large vesssel on the stove to warm some water for tea.I had been to Pangong lake many times during summers .During my stay at Spangmik,a village on the banks of the lake, I had heard the natives talk about the lake feezing during winters. It was always my fantasy to see this frozen lake and walk on it. I use to keep thinking how this huge blue water lake would look when it would turn into ice. Years of waiting ,I was witnessing my first Ladakh winter. Outside I could hear Muthup , my Innova driver trying to start up his engine. The fuel often freezes here at such low temperatures. I broke the frozen iced top layer in my bucket of water, and just managed, to wash my face, and wet my hair. An old pair of Quechua skiing pants, a red biking jacket, and a few brushes on my hair, and I am ready for the day. After a quick breakfast which was cornflakes with milk and a couple of glasses of black tea. Keeping hydrated is the key in Ladakh. The cold and the arid enviroment takes away the moisture fro your body. This condition can make you unwell. Most natural water sources are in frozen state. I filled up my two bottles of one litre each for the day. It’s 8 o clock , and we are out on the road. Travelling towards Karu, on the Leh Manali highway, I am exited about the journey , which lies beyond. We get the first signs of snow as we reach Serthi a small hamlet as you venture off the highway. The road towards Changla pass has had a recent snowfall. These Ladakhi drivers are amazing. With awesome ease they drive through these snow covered roads. Changla pass was cold. This pass has a aura of mysticism and thrill about it . The descend again towards Ramste was initially through snow. Most of the rivers and ponds were frozen. I reached Panggong at about 1.o clock in the afternoon. The lake had just started to freeze. 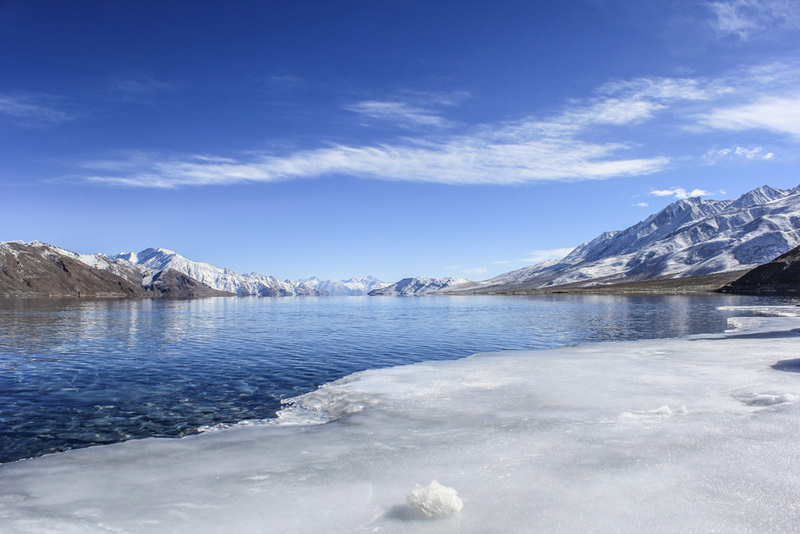 The starting Point of the lake had frozen to about an kilometre. It was time to live and experience a moment for which I had waited so long.It was a experience to walk on the frozen lake. I have come here so many times in the summer, but this was special. The temperature was around -30. It was getting cold. Its amazing , how many forms , mother earth changes, and its a treat to watch and explore her in her changing forms. I clicked a few pics, and sat on the banks of the lake. The view was awesome. Virtually all the eating places, homestays,and tents were closed. So I had to leave for Rumste. After a quick Maggie lunch at Rumste ,I headed for yet another journey across Changla to get back to Leh.